This film contains potentially disturbing graphic scenes of the results of violent assaults. We do not recommend bringing children to this screening. "In a Portrait of Violence, an Appeal for Reform"
"A disturbing, emotional, painful, infuriating, and hard-to-watch film but it's an important one"
Private Violence is a feature-length documentary film and audience engagement campaign that explores a simple, but deeply disturbing fact of American life: the most dangerous place for a woman in America is her own home. Every day in the US, at least four women are murdered by abusive (and often, ex) partners. 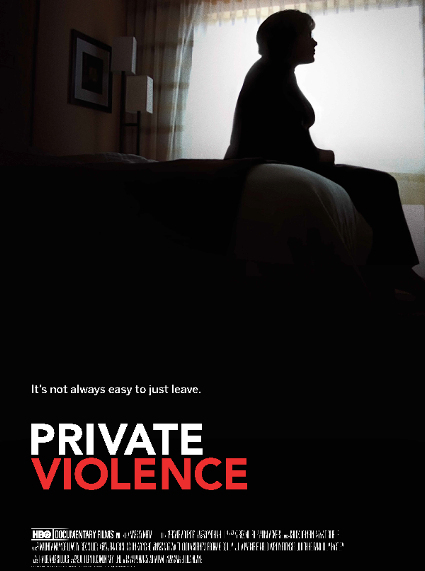 The knee-jerk response is to ask: “why doesn’t she just leave?” Private Violence shatters the brutality of this logic. Through the eyes of two survivors – Deanna Walters, a mother who seeks justice for the crimes committed against her at the hands of her estranged husband, and Kit Gruelle, an advocate who seeks justice for all women – we bear witness to the complicated and complex realities of intimate partner violence. Their experiences challenge entrenched and misleading assumptions, providing a lens into a world that is largely invisible; a world we have locked behind closed doors with our silence, our laws, and our lack of understanding. Kit’s work immerses us in the lives of several other women as they attempt to leave their abusers, setting them on a collision course with institutions that continuously and systematically fail them, often blaming victims for the violence they hope to flee. The same society that encourages women to seek true love shows them no mercy when that love turns dangerous. At 7:00pm on the First Tuesday of each month the UUCOC hosts free screenings of socially relevant films followed by a discussion of actions we can take.